What is the Indigenous Growth Fund? The Indigenous Growth Fund is a new, innovative fund created by NACCA that will leverage government investment to raise additional capital from institutional investors. The fund will make capital available to the Aboriginal Financial Institutions (AFIs) to provide loans to new and expanding Indigenous businesses. Why is the Indigenous Growth Fund needed? Indigenous economic development is the key to reconciliation. Indigenous businesses and entrepreneurs are the key drivers in economic development, contributing to both employment and wealth creation, which are necessary for the independence and sustainability of Indigenous communities. 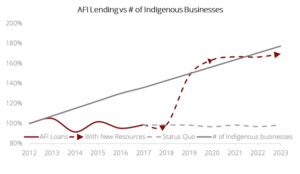 Aboriginal Financial Institutions (AFIs) have been the main source of capital, developmental lending and business support for this strongly growing segment of the Canadian economy. NACCA works for a network of AFIs, which have a strong track record: over the last three decades 45,000 loans have been made by AFIs worth $2.5 billion. Each year over $100 million in new loans are made to Indigenous businesses, 500 start-ups are financed, and 750 existing businesses are financed. This speaks to the strong performance and successes of the network; but the capital originally provided by government is no match for the growing demand for loans from Indigenous businesses. According to a survey by the Canadian Council for Aboriginal Business, access to capital is the number one major obstacle to growth for Indigenous businesses. The potential market for AFIs is 62,250 Indigenous businesses, which employ more than 124,000 Indigenous people (Canadian Business Patterns, Conference Board of Canada, 2016). 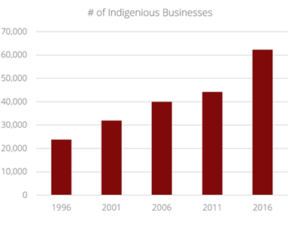 Despite growing overall numbers, the number of Indigenous businesses is still small relative to the size of the population, and few Indigenous businesses grow to the sizes that mainstream Canadian companies grow to. The key barrier to the creation and expansion of Indigenous businesses is access to capital. The Indigenous Growth Fund will be instrumental in addressing the shortage of capital. How will the Indigenous Growth Fund help Indigenous businesses and entrepreneurs? NACCA’s Indigenous Growth Fund will change the status quo by raising and injecting new capital, so that AFIs can provide more loans to the growing number of Indigenous start-ups and existing small businesses. The Indigenous Growth Fund will leverage the expertise and connections to Indigenous communities that the AFI network has nurtured for over 25 years.